One of the most hated stocks bull markets in history has passed its fifth year milestone with the DJIA last closing at 16,453, less than 1% away from its all time closing high of 16,577. This now five year long bull market that I termed as a stocks stealth bull market for much of its life-time has remained mostly invisible to the mass of retail investors who followed the approx 95% of that which purports to be market commentators but in reality are just journalists regurgitating ad nauseam the ramblings of clueless academics and a financial sales industry that is mostly populated by failed traders who have turned to selling services and products that never worked in the first place to trader and investor wannabe's, tools and services that are guaranteed to fail due to the fact their primary purpose is to perpetuate sales when the real secrets for successful trading are diametrically opposed to that which most are exposed to as illustrated below. The stocks bull market as measured by the stock market index that I have been tracking for some 30 years now, the DJIA closed at 16,453 up over 150%, whilst other popular stock market indices have recorded even greater gains such as the broader S&P500 up 177%, tek stock Nasdaq up over 240% and the small caps Russell 2000 up more than 250% that illustrate what I have consistently written for the DURATION of the past 5 years in that this bull market will turn out to be one of the GREATEST BULL MARKETS IN HISTORY! It is now 5 years since I strongly flagged the start of the stocks stealth bull market (Stealth Bull Market Follows Stocks Bear Market Bottom at Dow 6,470 ), which I have consistently reiterated in well over 200 articles and 3 ebook's (2010,11,13), where my strategy has been very, very simple, no black box voodoo to sell garbage to the unsuspecting masses but simply this - " The Greater the deviation from the stock market high then the Greater the Buying Opportunity Presented". And, you can't get any simpler than that ! However, one thing that has NEVER changed is the mass of media confusion (over 95% of what you read and watch) that purports to be stock market commentary, that just like clock work consistently warns that the bull market is not sustainable and that its end or even worse a crash is always imminent, which is even the norm today! The subsequent price action closely matches my trend expectations for the Dow to bottom around 15,250, and therefore implied that the correction of just 8% was over. Can you imagine all that doom and gloom that surrounded what in the end just amounted to just a minor 8% correction! 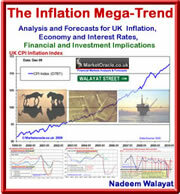 My next in-depth stock market analysis will follow in early April 2014, following the completion of my latest ebook in the Inflation Mega-trend series. Ensure you are subscribed to my always free newsletter to get BOTH in your email in box. Which followed a article that made my views clear on whether or not the bull market had ended during the heights of the U.S. government shutdown and debt ceiling crisis of October 2013. And so the series of articles continues all the way back to the birth of the stocks stealth bull market 5 years ago whilst the perma clueless bears are still waiting for the bear market to begin or even crash, where clearly if they had followed their own advice then they would have bankrupted themselves several times over by now, which goes to show that most of that which is written about the market is by those who do not even trade! My last ebook in the stocks stealth bull market series (Feb 2013) extensively covered what I deemed to be the real secrets if successful trading that you can Download for FREE. Ensure you are subscribed to my always FREE newsletter for my latest analysis and concluding detailed trend forecasts in the stocks stealth bull market series. This weekend FEAR is back.. Bull Market is Over.. nice 5 year anniversary. April brings more conflict between USA and Russia sending markets down into July. More than a 20% correction is coming.